I first came across Elina Brotherus’s work when I was researching photographic self portraiture for my I am an Ironman series. Brotherus’s work is well documented on her website (http://www.elinabrotherus.com/news/). 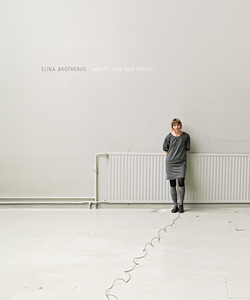 She has also recently published a ‘retrospective’ monograph of her work (Brotherus 2012). Much of Brotherus’s early work was made at times when she was going through periods of significant change in her life. It was as if personal crises motivated her to take up the camera. She is quoted as saying ‘Creating images shakes me up; and when life is ‘shaky’, I get the urge to take photographs,’ (Culturebase.net). Her approach was one which inspired me to take on my own self portraiture project in which I deliberately made my self portraits at moments when I was tired and distracted (after completing training workouts). Most of her early work was autobiographical but the issues she confronts have resonance for women in general. More recently she has continued to use herself as a model but not in an autobiographical way. Her work has become depersonalised as she’s moved on to explore more universal issues. Susan Bright suggests that her work now comprises of ‘ …a combination of objective conceptual thinking and the emotional and personal (Brotherus 2012, pp15). Brotherus has been exploring many issues of classical painting in her more recent photographic series The New Painting, The Artist and her Model and Artists at Work. Her photographs span landscape, interiors, still life and figure studies. She says that she is primarily interested in the problems posed by the human figure as a model. Issues such as ‘How do the figures interact with space and with each other? How does the light reveal the form? What happens if the direction of the gaze changes?’ (Culturebase.net). Much of her work now places her model (or self) in the landscape. And I have found these photographs very interesting. Particularly since I am planning to explore the idea of making portraits in the landscape myself (see my previous post here). Brotherus’s photographs of people in the landscape are not portraits as such. She has been examining the relationships between the human figure and space, along with the effects of changing the direction of the gaze of the subjects. In her work one can see references to painting with her studies of bathers owing something to Cezanne and her foreground figures looking out into the landscape taking on the position and significance of David Casper Friedrich’s ‘Rückenfigur’. Brotherus’s formal language is very subdued preferring in her words to ‘provide viewers with a blank screen, a surface on which to project their own feelings and desires.’ That said I find many of her images, particularly those made in the landscape have a calm, tranquil beauty about them. Whilst not overtly expressive they nevertheless impinge on the emotions. The following statement taken from her written text for her photography degree can now be seen as a statement of intent: ‘pure emotion, eye to eye and authentically shown is relatively rare in photographs’ (Brotherus 2012, pp76). I think that many of her photographs achieve this rare quality.